1941: during World War II, three Jewish brothers in German-occupied Poland lead a band of Jewish rebels and refugees in fleeing the Holocaust and fighting back against Ze Chermans. 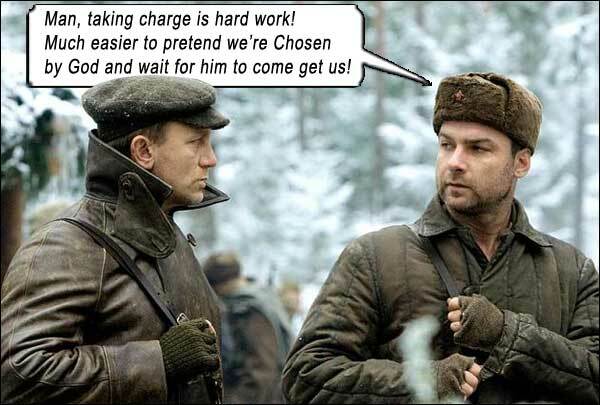 From a book by Nechama Tec, Defiance: The Bielski Partisans, Edward Zwick directs DEFIANCE, following the Bielski brothers, Tuvia (Daniel Craig) and Zus (Liev Schreiber), as they lead over 1,000 refugees to safety in the Belarussian forests. Jamie Bell plays their younger brother, Asael. It’s Based On a True Story. But seriously – who cares? Besides the descendants of those refugees. Haven’t we exhausted the compelling “true stories” from World War II? We’re into a generation of viewers whose knowledge of WWII comes from the History Channel and boring school teachers; they’re more familiar with al Qaeda, Iraq and maybe the 1990 Gulf War. To this younger generation, The Berlin Wall was something that Reagan told Mr. Gorbachev to tear down; and Pink Floyd did that concert there after the fact. How uninterested can they possibly be in the tribulations of a few Jews in 1941 Europe? Well, I guess that’s why Daniel Craig is so hot. To draw in the target audience of 19 year old girls. Who will be followed by 21 year old boys. Best thing about DEFIANCE is its ruthlessness. Tuvia mercilessly – and very satisfactorily – executes the Germans who killed his parents. Yet he tells brother Zus “We must not become like them.” I guess he means they must not take joy in their killings, as they both seek out and execute all the Jewish traitors to their cause. Revenge is sweet, poison and all. It is great to see Jews fighting back for once in a war movie. Up to now, the image of the war Jew has been Auschwitz victims, sunken faces, long woolen overcoats, crumpled hats, queuing for gas chambers. DEFIANCE gives us sexyboys with machine guns, muscles and mojo. Not whining about their constant persecution or their bad gout. No lawyers and bignoses and funny hat wearers, but warriors leading a bunch of lawyers and bignoses and funny hat wearers. Not mournfully sitting around for God to deliver them, bellyaching prophecies of a chosen one who would bring balance to the Force (as a large contingent do, cowering hidden in the city, led by Mark Margolis). The Bielski brothers are movers and shakers who deliver all these stereotypes out of the defeated city, build a forest community, ally with Russian resistance fighters, cut down troublemakers in their midst, and mow down Germans with guns blazing. DEFIANCE suffers for being too far removed from our sensibilities. I guess a patriotic Jew would find it inspirational, but it is just one basic idea stretched over two hours: furtively hide, shoot Germans, furtively hide, shoot Germans, furtively hide, shoot Germans… okay, two basic ideas. Writers: Edward Zwick, Clayton Frohman, Nechama Tec. Starring: Daniel Craig, Liev Schreiber, Jamie Bell, Mark Margolis, Alexa Davalos, George MacKay, Allan Corduner, Mark Feuerstein, Iben Hjejle, Tomas Arana, Kate Fahy.